← DHEA – for Depression in Elderly – Seemed Like a Good Idea..
POT’s is a syndrome where one is unable to maintain blood pressure standing and so often faint – and is often associated with attacks of tachycardia. Finding this situation in a chronic pain patient, greatly complicates the situation, and makes pain recovery less likely. I find myself scratching my head about where to go. Association of POTS with autonomic neuropathy brings up issue that certain Fibromyalgia cases have small fiber neuropathy. Autoimmune mechanisms are involved and question lies, which ones would respond to IV gamma globulins or Plasmaphoresis – certainly the ones with frank Chronic Demyelinating Inflammatory Polyneuropathy (CIDP) but what about milder forms? Prednisone steroid pulses work in early CRPS and could help some autonomic neuropathy (certainly in CIDP) – but when to try? Measuring certain antibodies might help but in some situations testing is rare or unavailable. Association of a case of POTS with chairi malformation brings up association of certain FM cases with treatable chairi syndrome cases. Our MRI testing is either unavailable or untrustworthy. Large association of POTS with Ehlers-Danlos hypermobility syndrome makes pain issues much more likely. Saw one case of CRPS caused by superficial radial nerve injury from unstable distal radius. Does one dare try prolotherapy to an already painful site? Body- wide serotonin in POTS is low and POTS is associated with high suicide risk, adding a deeply troubling challenge to pain in POTS cases. Treatment of associated sleep apnea with CPAP may be complicated. Ordinary CPAP might not work and BIPAP might need to be tried. The anxiety that is associated might limit mask use and in one case, clonazepam 1 mg hs had to be used to reduce nightmares and ensure CPAP use. Cases are found of CRPS and POTS helped by treatment of bacterial overgrowth. Is this why Cefadroxil antibiotic cured one CRPS case? Using Naltreoxone dual opioid blocker /mild stimulator could help CRPS and POTS but how does one get subjects off opioids first? Rare POTS cases found deficient in thiamine, B12 and Vitamin D offer rare cures. These deficiencies also flare Fibromylagia. Treatment of the POTS with local measures and Flourinef and or Midodrine can help. Autonomic testing in women with chronic pelvic pain. The Journal of urology 196.2 (2016): 429-434. Mayo Clin Proc. 2012 Dec;87(12):1196-201. COMPASS 31: a refined and abbreviated Composite Autonomic Symptom Score. International journal of medical sciences 7.2 (2010): 62. Chemali, Kamal, and Kevin Mc Neeley. Co-Morbidities of Neuropathic Postural Orthostatic Tachycardia Syndrome and of the Autonomic Neuropathies (P1. 093). Neurology 82.10 Supplement (2014): P1-093. Small fibre neuropathy and Collagen IV reduction in Postural Tachycardia Syndrome and Joint Hypermobility Syndrome. Autonomic Neuroscience: Basic and Clinical 192 (2015): 125. Fibromyalgia – Further Elucidation of Small Fiber Neuropathy Presence. Caro, X. J., Winter, E. F., & Dumas, A. J. (2008). A subset of fibromyalgia patients have findings suggestive of chronic inflammatory demyelinating polyneuropathy and appear to respond to IVIg. Hendrickson, Jeanne E., et al. Complex regional pain syndrome and dysautonomia in a 14‐year‐old girl responsive to therapeutic plasma exchange. Journal of clinical apheresis 31.4 (2016): 368-374. Thieben MJ, Sandroni P, Sletten DM, et al. Postural orthostatic tachycardia syndrome: The Mayo Clinic experience. 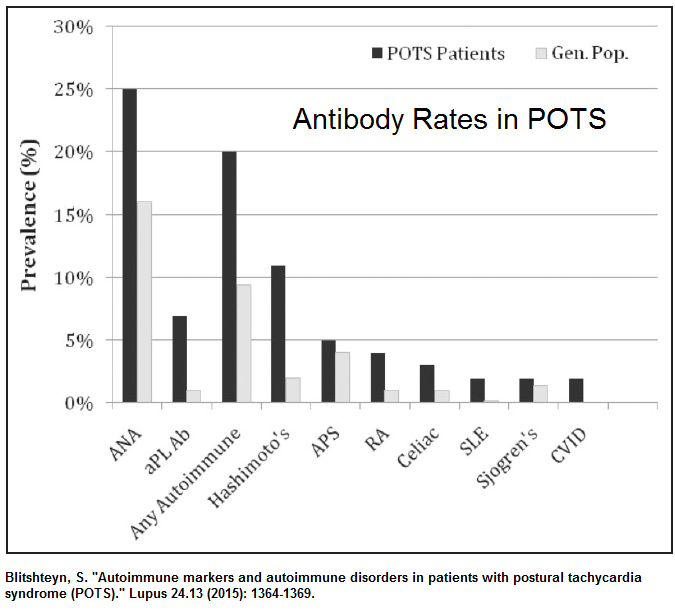 Autoimmune markers and autoimmune disorders in patients with postural tachycardia syndrome (POTS). Autoimmunoreactive IgGs against cardiac lipid raft-associated proteins in patients with postural orthostatic tachycardia syndrome. Translational Research 162.1 (2013): 34-44. Kanjwal K, Karabin B, Sheikh M, et al. Cholinergic Antibodies studies have now accumulated – these receptros are mediated by acetylcholine and are of 2 types – muscuranic (mAChR) and nicotinic (nAChR). Some of those with mostly nicotinic receptor antibodies has symptoms restricted to sicca syndrome(dry mouth and eyes), GI symptoms, and neurogenic bladder. Rest had panautonomic features. Raj SR(1), Black BK, Biaggioni I, Harris PA, Robertson D.
Jones, K. D., et al. A six‐month randomized controlled trial of exercise and pyridostigmine in the treatment of fibromyalgia. Arthritis & Rheumatology 58.2 (2008): 612-622. Li H, Yu X, Liles C, et al. Autoimmune basis for postural tachycardia syndrome. J Am Heart Assoc 2014; 3: e000755. Ep Europace 19.7 (2016): 1211-1219. Antidepressants suppress neuropathic pain by a peripheral β2-adrenoceptor mediated anti-TNFα mechanism. My summize – which if blocked by auto-antibodies is going to blunt descending pain inhibitition and increase pain. 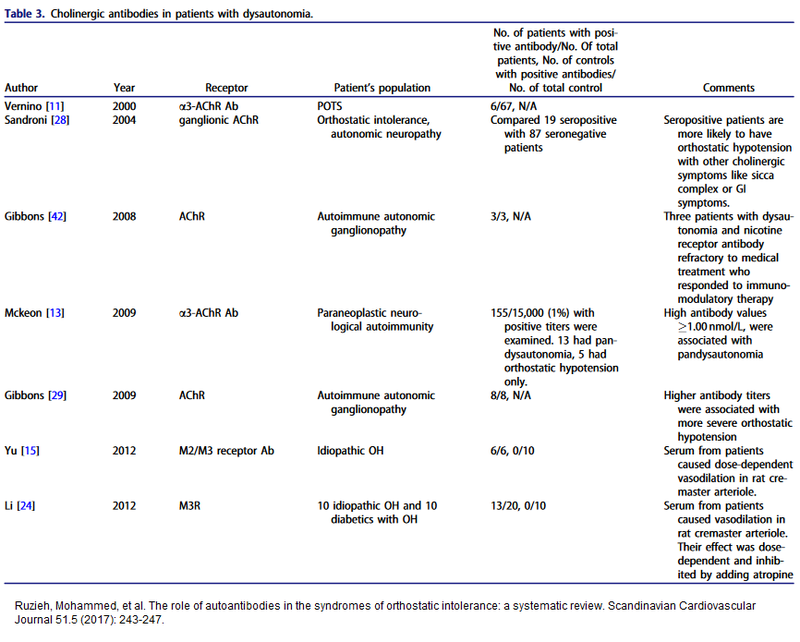 The role of autoantibodies in the syndromes of orthostatic intolerance: a systematic review. Scandinavian Cardiovascular Journal 51.5 (2017): 243-247. Blitshteyn, Svetlana, and Jill Brook. Postural tachycardia syndrome (POTS) with anti-NMDA receptor antibodies after human papillomavirus vaccination. Immunologic research 65.1 (2017): 282-284. Butts, Breann N., Philip R. Fischer, and Kenneth J. Mack. Human papillomavirus vaccine and postural orthostatic tachycardia syndrome: a review of current literature. Journal of child neurology 32.11 (2017): 956-965. Inflammatory biomarker profiling in classical orthostatic hypotension: Insights from the SYSTEMA cohort. International journal of cardiology 259 (2018): 192-197. Summary – Autoimmune features are common in both POTS and Fibromyalgia. More severe forms and childhood versions can respond to IV gamma globulin, plasmaphoresis and maybe pulse steroids. The question is, which milder version would too. When would later mentioned antibody tests become available? Eur Spine J. 2004 Oct;13(6):516-23. Epub 2004 Apr 9. Clinical evidence for cervical myelopathy due to Chiari malformation and spinal stenosis in a non-randomized group of patients with the diagnosis of fibromyalgia. Treatment of cervical myelopathy in patients with the fibromyalgia syndrome: outcomes and implications. Journal of Neurology, Neurosurgery & Psychiatry 76.7 (2005): 1034-1036. I had a case undiagnosable here, but seen on the same (though thought blurred) MRI images, diagnosable in the States. Makes me think our machines and image taking are inferior here, and competence in seeing certain cases of chairi, is a specialty feature. Clin Orthop Relat Res. 2015 Feb;473(2):722-8. Low, P. A., Opfer-Gehrking, T. L., Textor, S. C., Benarroch, E. E., Shen, W. K., Schondorf, R., … & Rummans, T. A. (1995). Postural tachycardia syndrome (POTS). Neurology, 45(4 Suppl 5), S19-25. RD, Vernino S, Lennon VA, Shen WK, Low PA.
Gazit Y, Nahir AM, Grahame R, Jacob G. Dysautonomia in the joint hypermobility syndrome. Am J Med. 2003;115:33–40. Gunning III, William T., et al. Postural orthostatic tachycardia syndrome is associated with platelet storage pool deficiency. Clin Auton Res. 2017 Apr;27(2):75-81. Health-related quality of life and suicide risk in postural tachycardia syndrome. In Fibromyaglia, there is a high Bipolar rate – varying from 20-26% on 2 surveys. tachycardia syndrome: a randomized, crossover trial. |Treatment of associated sleep apnea with CPAP may be complicated. Ordinary CPAP might not work and BIPAP might need to be tried. The anxiety that is associated might limit mask use and in one case, clonazepam 1 mg hs had to be used to reduce nightmares and ensure CPAP use. Miglis, Mitchell, Srikanth Muppidi, and Safwan Jaradeh. Sleep Disorders in Patients with Postural Tachycardia Syndrome (P1. 279).” Neurology 84.14 Supplement (2015): P1-279. It has been suggested that “gastrointestinal dysbiosis” can trigger mitochondrial dysfunction, microglial activation, and neuroinflammation seen in fibromyalgia and CRPS. Neuroinflammation in fibromyalgia and CRPS is multifactorial. Nature Reviews Rheumatology 12.4 (2016): 242. Cases are found of POTS helped by treatment of bacterial overgrowth. Weinstock, Leonard B., et al. BMJ case reports 2018 (2018): bcr-2017. Ware, Mark A., and Gary J. Bennett. Case report: long-standing complex regional pain syndrome relieved by a cephalosporin antibiotic. Lyons, Jonathan J., et al. Nature genetics 48.12 (2016): 1564.
they used only 1 mg /day(“as opposed to ideal dose of 4.5 mg”- for financial reasons). Chopra, Pradeep, and Mark S. Cooper. Journal of Neuroimmune Pharmacology 8.3 (2013): 470-476.
narrows down the issue t0: “During neuroimmune activation, TLR4 (Toll-Like Receptor 4) is upregulated in microglia” – “This correlates with the rodent developing neuropathic pain”. TLR4 “augments the production of pronflammatory cytokines via the NF-κB pathway”. Naltrexone is a TLR4 antagonist and works to suppress neuropathic pain in the rat model. Naltrexone may help Fibromyaglia pain. Vitamin B1 deficiency in patients with postural tachycardia syndrome (POTS). Neurological research 39.8 (2017): 685-688. Chaudhari, Shilpa Abhay, Alan Sacerdote, and Gul Bahtiyar. “1-α hydroxylation defect in postural orthostatic tachycardia syndrome: remission with calcitriol supplementation.” BMJ case reports 2012 (2012): bcr0220125730. Antiel, Ryan M., et al. “Iron insufficiency and hypovitaminosis D in adolescents with chronic fatigue and orthostatic intolerance.” Southern medical journal 104.8 (2011): 609-611. Schenkel, Laila C., et al. “Mechanism of choline deficiency and membrane alteration in postural orthostatic tachycardia syndrome primary skin fibroblasts.” The FASEB Journal 29.5 (2015): 1663-1675. Comments – this is a huge field that is just beginning to become clear. It is clear many avenues need to be pursued in treatment of this symptom complex. Antidepressants may be indicated for both serotonin effects and mood. Rarely occurring deficiencies, sleep disorders, and bacterial overgrowth treatment might help. More severe cases may need steroid pulses, pulse immunoglobulins, and plasmaphoresis. Association with mast cell syndromes needs attention. This entry was posted in complex regional pain, Deficits, Depression, Fibromyalgia, mast cell disease. Bookmark the permalink.